These are the most comfortable wooden seats you will ever sit in! No stuffy dining room chair here. Each seat is carved by hand using compass planes and chisels. Shown here in Black Walnut with Ebony Stain and Tung Oil. We can customize sizing and wood choice. Also available in Mahogany, Black Walnut, Vermont Cherry or Vermont Maple. Also available with Upholstered seat. Provided in Muslin. Curved taper on front legs . A perfect companion for our Riverside Trestle Table. Seat width 23", depth 19", height 18"
Please call for shipping quote and lead time. These side chairs are just as comfy as our Riverside Arm! Each seat is carved by hand using compass planes and chisels. Shown here in Black Walnut with Ebony Stain and Tung Oil. We can customize sizing and wood choice. 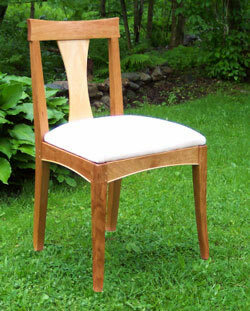 Also available in Mahogany, Black Walnut, Vermont Cherry or Vermont Maple. Seat width 21 1/2", depth 18 1/2", height 18"
Please call us for a shipping quote and lead time. Beautiful colors, depth and richness all describe our Burr Farm Chair. Simple elegance. 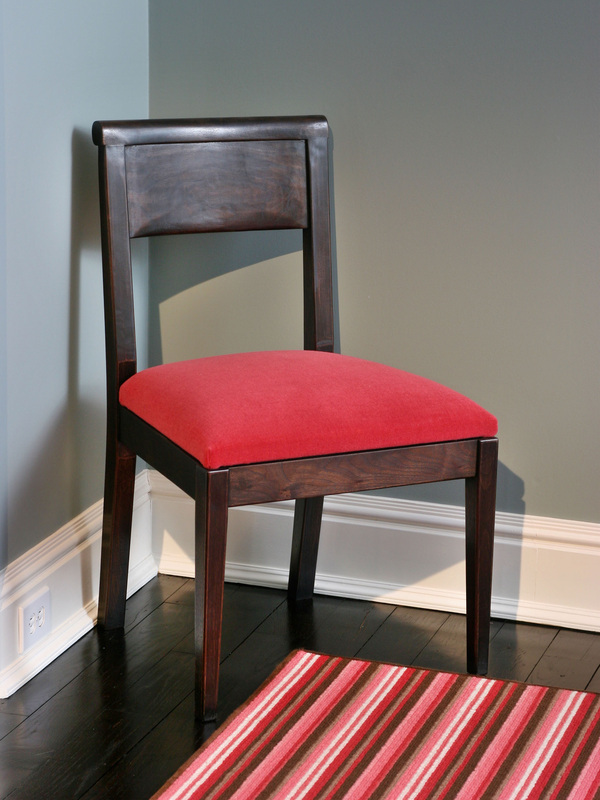 This comfortable and soft chair can be upholstered in any fabric. 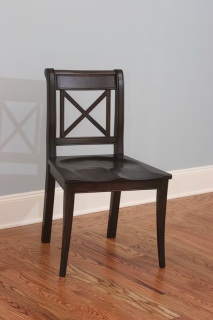 So versatile, the Burr Farm Chair is perfect in the dining room, but feel free to pair it up with a computer desk, in a guest room or as an extra chair in the living room. 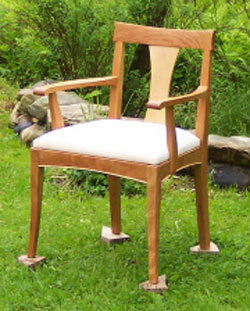 Also available with a hand carved wooden seat(similar to Riverside Chair). 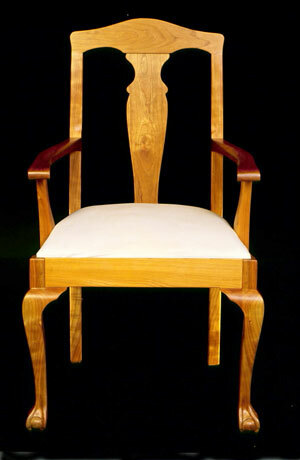 The Reis Chair has handcarved ball and claw feet, handcarved arms and is made from solid Vermont Cherry. 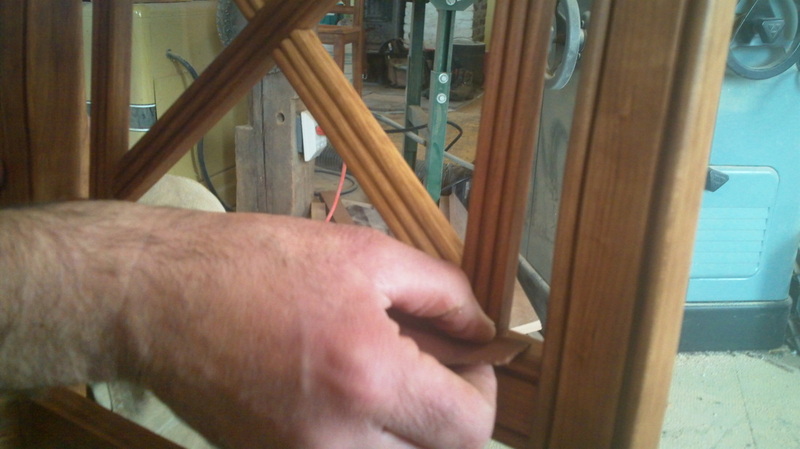 Traditional pinned mortise and tenon joinery and hand rubbed Tung Oil applied. 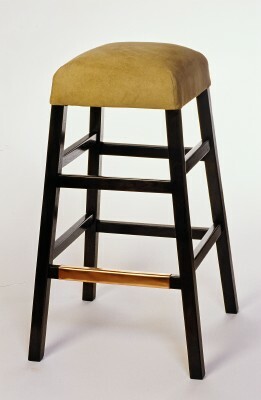 Also available in Black Walnut, Mahogany or Vermont Maple. Horsehair seat cushion on solid hardwood frame in Muslin. Please call for a shipping quote and lead time. 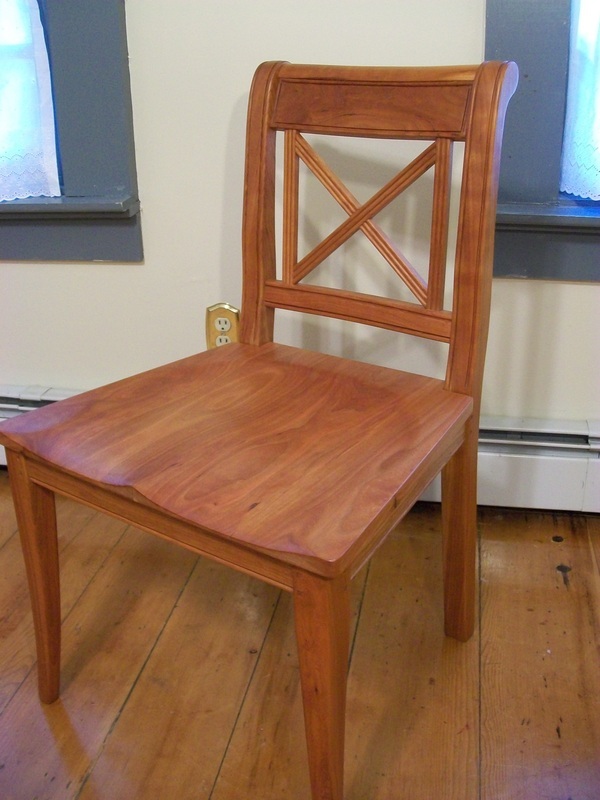 Our Westport Arm Chair comes in Vermont Cherry with Vermont Maple accents and is finished with Tung Oil. The Maple bead highlights the curved skirts. 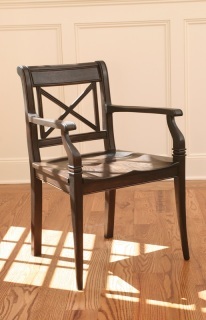 Hand carved Maple center back add character and variety to the chair. 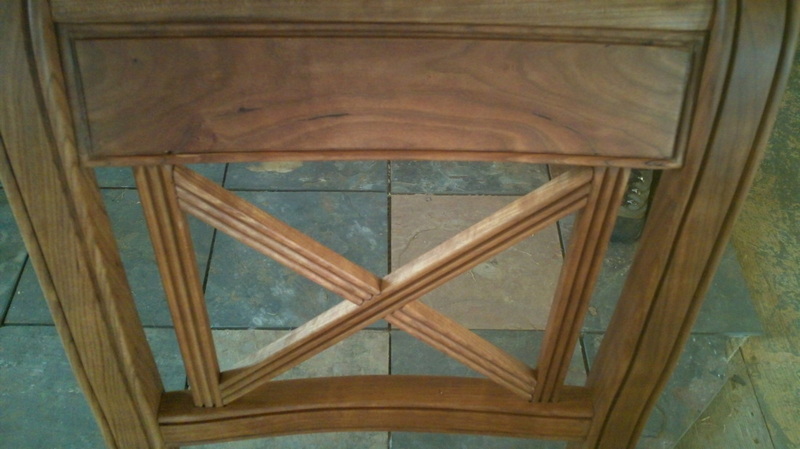 Traditional mortise and tenon joinery throughout. We can customize! Black Walnut, Vermont Maple, Mahogany and Vermont Cherry also available. 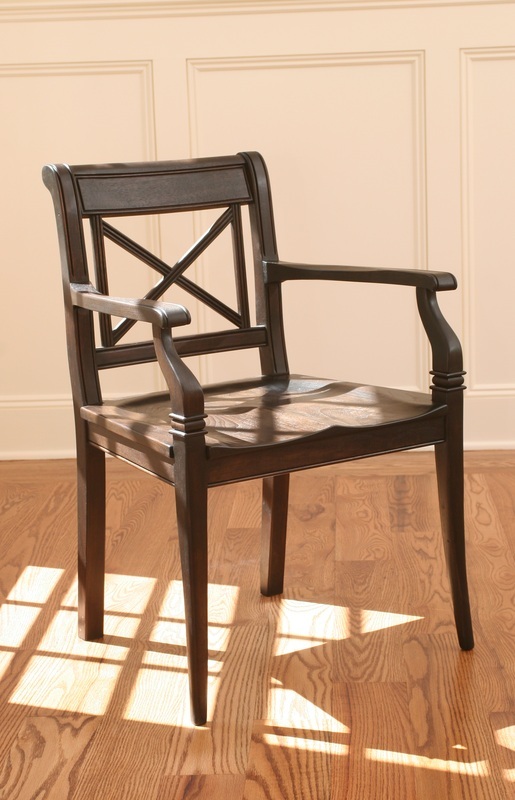 Our Westport Chair comes with all the same fabulous details as our Westport Arm Chair... Vermont Cherry with Vermont Maple accents and is finished with Tung Oil. The Maple bead highlights the curved skirts. Hand carved Maple center back add character and variety to the chair. 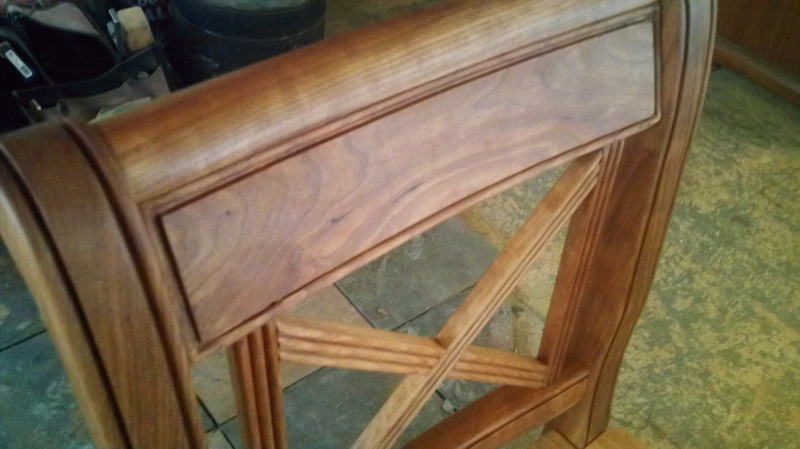 Traditional mortise and tenon joinery throughout. Very comfortable and gorgeous to look at, too! 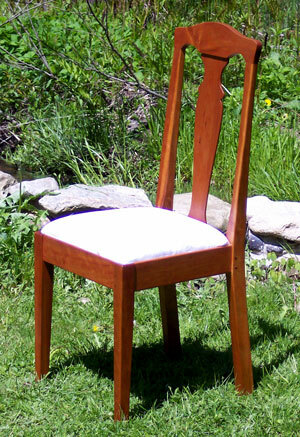 All chairs have wooden seat frames and are upholstered and finished in muslin. Customers can supply fabric or can contact our upholsterer, Upper Room Upholstery for more choices.